Disclaimer: This post includes affiliate links from AirBnB. Should you happen to book a trip with them, you'll receive $40 in travel credit, and I'll receive $20. It's no secret that I love using AirBnB when I travel. Given how often I travel, if I've got a trip that's longer than two nights, I enjoy staying at an apartment or house because it's just more comfortable. There is more room, better opportunities to film yoga videos due to the space, the option to cook my own food (which is something I prefer because my stomach is sensitive to things like canola oil which a lot of restaurants use), and it gives me an opportunity to see how the locals live. But it isn't easy to pick a great AirBnB and I've definitely had my fair share of duds. Over the years, I've learned to follow a few key rules to ensure I get a great space, and I thought I'd pass them on to you. Once, I blindly picked a house in Costa Rica based on the great photos, not even realizing that there were no reviews. When I showed up, the house was not as pictured. By a long shot. I was running a retreat (ugh), and I just had to grin and bear it, but from there on out, I never booked a place without reading the reviews. And you've got to be discerning when reading the reviews. Some people complain about stuff that isn't important to me. Like the fact that the windows had streaks from the cleaning crew (seriously, who cares?). Other times, you can get a feel for how much the host cares about the people staying. Some people will report minor issues (like a broken fan), and how the host had it replaced within a half hour. Either way, check the rating, and read the reviews. 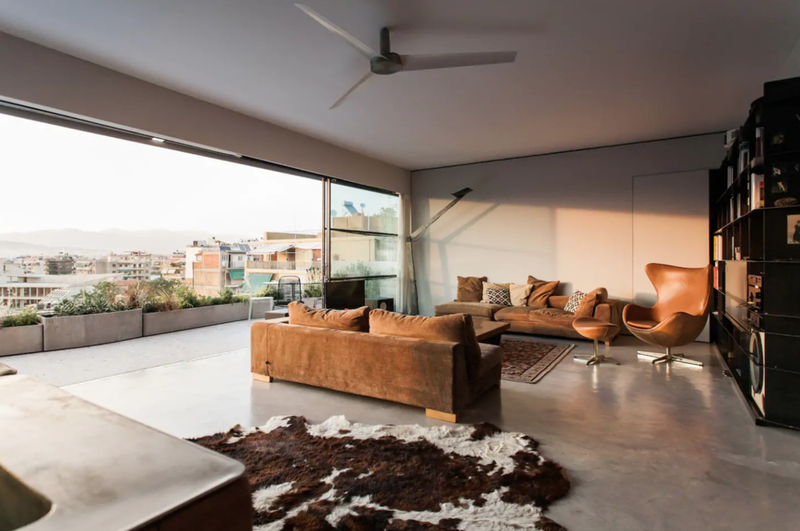 I recently booked a really cool industrial apartment with minimalist decor and a sweeping view of Athens, Greece. The price was right, the reviews were great, but when I told my friend who lives in the city, she was like, "Ok I'm going to be honest with you. That neighborhood is pretty rough. You won't be in danger, but there is a lot of open drug use, petty crime, and brothels around." Sure enough, I arrived, and the host said, "Don't walk in that direction - there is a lot of drugs and brothels - but walk anywhere in this direction and it is beautiful!" They were right. This apartment was on the edge of a pretty rough neighborhood. I never felt unsafe, but I think that may be due to the fact that the city I currently live in is a rough area, so I'm used to it. I'm also a pretty seasoned traveler. I know how to blend in, and not look like a tourist. But I want to mention it for anyone who may not feel comfortable staying in a rough area. Essentially, take a look at where the AirBnB apartment is on the city map and then google the neighborhood to find out what it's like to see if it'll work for you. For me, it's important to make sure the host has excellent communication and a solid wi-fi connection for work. I love that the AirBnB site allows you to search by Superhost, which is someone who has a reputation as being an exceptional host. These people will generally go above and beyond in terms of communication (ie answering emails quickly), recommendations for the area, and giving a warm welcome (I've had Superhosts leave a bottle of wine or fresh baked goods upon arrival). The communication piece is really important to me because if I have any questions, it's really helpful to have someone in the know be able to answer quickly. AirBnB also allows you to search by "Business Travel Ready" which means that their place is excellent for business travelers. Usually this includes excellent wi-fi, a convenience place to set up your laptop, and easy keyless entry so that you can arrive any time without having the host wait around to greet you. As someone who needs to be able to work from anywhere, I always choose this when searching for a great AirBnB. But even if you're not traveling for work, there are so many other options - pool, laundry, off-street parking, pets allowed, etc. Make use of them so you can find the best place for your needs. One of the aforementioned duds I unknowingly booked off AirBnB was in Amsterdam. The apartment was in a fantastic location - we could walk to everything, which was great because we had Buckles with us - but the apartment itself was subpar. The flooring was made of plywood and was withered and uneven. The walls were super thin and we could hear everything in the neighboring apartments. The windows were old and the apartment was drafty. At the time I was booking, I just cared about booking a place in a great location, but when I arrived, I realized I forgot that I was still sick with Lyme disease and would be spending a good portion of the time in the apartment. I desperately wished I'd looked for a place that had book a great location and a comfortable interior. Sometimes you know you'll be out and about exploring and don't care too much about the inside, and other times you know you'll be inside the majority of the time and in that case, you'll want a spot you feel very comfortable in. Either way, take a moment to think about the type of place you want, how frequently you'll be hanging out in the apartment, and search accordingly. These few key rules have served me well over the years, and I'd love to hear if you have any other AirBnB tips down in the comments section below!